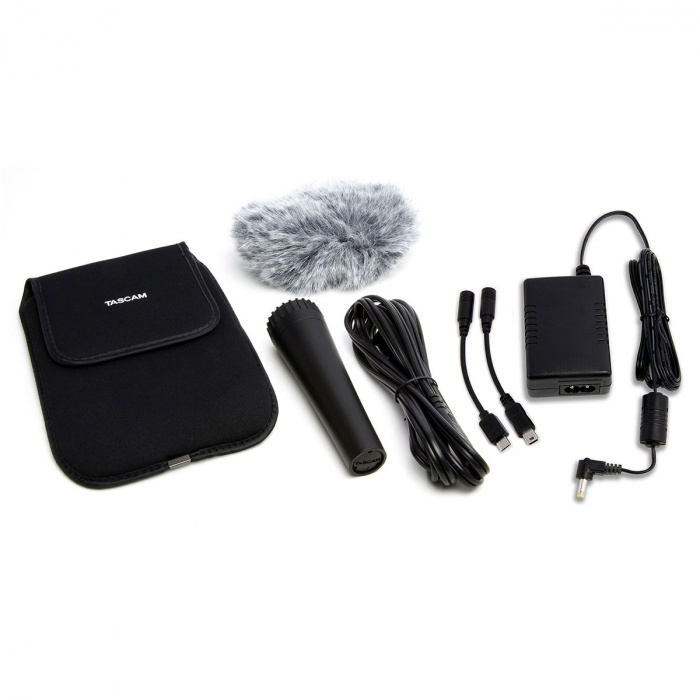 The AK-DR11GMKII Handheld DR-Series Recording Accessory Package from Tascam features a furry windscreen to reduce wind noise, a grip to facilitate handheld recording, a power adapter, and a soft carrying case. It can be used when capturing audio outdoors and is compatible with the Tascam DR-05, DR-07MKII, DR-40, DR-22WL, DR-44WL, DR-100, DR-100MKII, DR-100MKIII recorders. Even a slight breeze can enter the mic on the recorder and cause wind noise. Applying the furry windscreen atop your device will prevent this interrupting noise. The grip can be attached to any DR-series recorder via the tripod holes when recording by hand. This helps reduce handling noise. Additionally, the power adapter allows you continuous recording, and the soft carry case permits easy transport and storage.